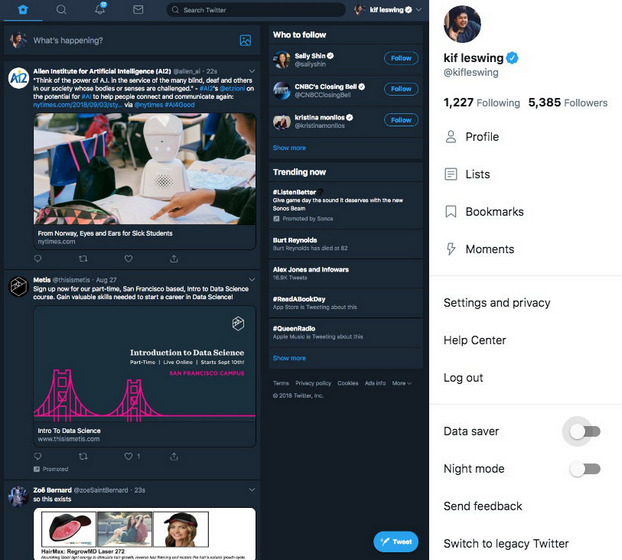 Twitter is testing a major redesign of its desktop site, adding a number of new features that were so far available on the company’s mobile website as well as on its mobile apps. The new features include a night mode, a data-saving mode, bookmarks, and more. A Twitter spokesperson reportedly told Business Insider that it’s a ‘limited test for now’, but didn’t give any definitive time-frame for it to be rolled out to a wider audience. According to information shared by the company, the Night Mode and Data Saver mode can be activated through a toggle on the profile page, while the Trending Now menu and the Profile section have been relocated to the other side of the page (under the Who to Follow suggestions) for a cleaner two-column look. Twitter has also redesigned the Compose Tweet popup window, removing the compose box in favor of an open space, as well as by relocating the Tweet button to the top. What’s more, there are new embed options for tweets, such as the ability to adjust the color of hyperlinked text, and more. As pointed out by Business Insider, the new site is very likely a Progressive Web App (PWA), which is an emerging standard. PWAs can support offline operation in select cases, they integrate with platform features such as notifications, and can even be pinned to app launchers, home screens or the Windows Taskbar, which allows users to treat them as ‘real’ applications rather than basic web pages. The new features are not yet available to any one at our office, so it will be interesting to see how long it will take for Twitter to expand its test and roll it out to a larger user-base.